I can't really remember when was the last time I wrote a post for the Toxic Literature label. Let me see... April the 6th, 2014... that was nearly a year ago. I must have read like 30 books since then, but not all science-related, I must assume. Because it has been so long I decided to approach you with controversy, not created by myself but already out there on the shelves of dedicated bookstores. The books covered today are from a journalist talking about science to the eyes of funny skeptics, and a scientist attempting to be funny as he reports his life experiences of a cultural modus-operandi (even more volcanic because it hasn't been translated to English to avoid lost-in-translation errors, as said by the author). I don't really know how accurate my interpretation is, but I can assure you that both make use of humour. On both occasions controversy emerged and social eruption of a tsunami magnitude was propelled. In any case, if you read any of these books, by all means, share your views with us knowing that this is a free space but a respectful one. I know these books can generate passionate opinions, but science is a progressive area where debate is fuel. Price: Kindle version at £4 and Paperback at £7 on Amazon. Editor's summary: "Why do obviously intelligent people believe things in spite of the evidence against them? Will Storr has travelled across the world to meet an extraordinary cast of modern heretics in order to answer this question. He goes on a tour of Holocaust sites with David Irving and a band of neo-Nazis, experiences his own murder during 'past-life regression' hypnosis, takes part in a mass homeopathic overdose, and investigates a new disease affecting tens of thousands of people - a disease that doesn't actually exist. Using a unique mix of personal memoir, investigative journalism and the latest research from neuroscience and experimental psychology, Storr reveals why the facts just won't convince some people, and how the neurological 'hero-maker' inside all of us can so easily lead to self-deception and science-denial. The Heretics will change the way you think about thinking." Most voted customer review: "Why people believe strange things (and why they can't help it). I really enjoyed this. It is a little like The Believing Brain inasmuch as Storr says that belief comes first and only then do we justify that belief. We discard evidence against our belief and give too much credence to evidence that supports our belief - this is the confirmation bias. A large part of our belief is hereditary, e.g. political views. Oddly, and to paraphrase the author, being clever doesn't make one any more impartial, it just makes one better able to defend one's prejudice that was arrived at purely emotionally! We are all unable to escape our biases, because that is who we are - it is impossible to look beyond them. Nervous "pulses" combine in the brain and the brain makes a model of the world and at the centre of this model is the illusory self - the hero and centre of the universe, but apparently this, too, is a deception and an illusion. An illusion we will do anything to preserve and protect, leading to such cognitive contortions like cognitive dissonance (a kind of intellectual ambivalence to protect integrity of self) and confabulation (making up strange excuses to preserve one's model, that one honestly believes, but which are untrue). 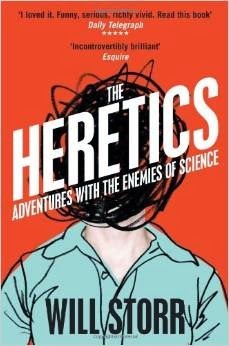 One amazing insight is on page 349 when he says that the scientific method is a tool humans have developed to break the mind's storytelling narrative and model-making (everything we perceive and experience is a model the brain has made of the world, not the actual world) - its prejudices and biases. To remove emotion and anecdote. But it isn't easy because science is difficult to grasp and understand and heresy is usually easy and instinctive - 'instinctive' should start alarm bells ringing after reading this book." Price: Kindle version at £8.99 on Amazon. Editor's summary: "A script of funny weekends and frustrated attempts to make holidays in England, is the starting point for a tour of Anglo-Saxon culture, as seen through the eyes of a Portuguese Scientist living in the UK for over twenty years and from whom we are more used to read popular science essays. Bifes Mal Passados is alternately hilarious and serious, inviting reflection on cultural identity, and urging the Portuguese to get rid of their inherent inferiority complex. Joao Magueijo is a scholar of the cosmos, and was one of the pioneers of the theory of the variable speed of light. He is currently a professor at the Imperial College, in London. On the only two occasions he went fishing he got a mullet and a piranha (a real fact, but the best comedy is indeed the events narrated in this book)." Translated from Portuguese. 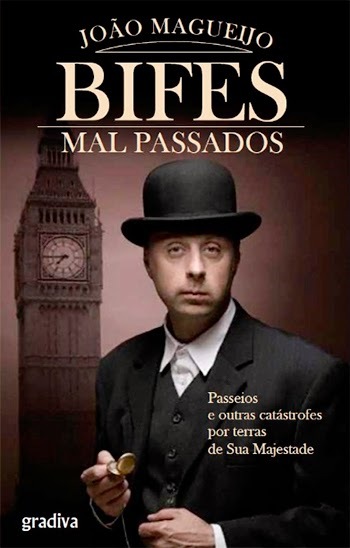 Most voted customer review: "Bifes Mal Passados" is not about destroying the English people or the English culture it is just about what any person sees out there when arriving to or living in England for a while, but due to cultural differences it is exaggerated and raised to the power of a thousand swear words. Everything described in this book has been witnessed by citizens from other nationalities during their time in England, seen live on a daily basis. There is an extreme need for humility when you read an analytical book that goes beyond what we know from what is told in schools. This books travels through the spectrum of social dogmas, paradigms and problems so deeply embedded in the English society that most of the English folks take it as an attack to their culture when, in fact, for other people coming from abroad and accustomed to different perspectives and behavioural models, it is their culture seen with positives and negatives. The greatest problem of this book, contrarily to for example "The Portuguese - A Modern History" by Barry Hatton, is that the language is funny and harsh, and any English citizen reading it will need a strong capacity to admit "Yes, we are just like that". But that attitude is itself so contrary to the (unfortunately still remaining) Imperial DNA transpiring from the social fabrics that immediately generates hatred. I read comments all over the internet trying to generate a movement to fire Joao Magueijo, humiliating the Portuguese police in what concerns the McCann file, calling the Portuguese PIGS, bankrupt, corrupt, stupid. I wonder for a second if any of these people actually read the book. The answer is a clear NO, because for most of those who cannot go beyond their assumption of royal superiority, there is no need to study the subject of social habits when they are our own habits. Everyday different nationalities are humiliated on national/public television, especially these days with UKIP-driven shows blaming Romanians, Bulgarians and also Portuguese on the matter of border control and European laws. These people also have hearts, brains and an inherent dignity that hurts when unjust comments are made. This book is not about unjust comments, but INDIVIDUAL observations from a known eccentric/slightly arrogant Professor that happens to be accepted by many other people who come from abroad to live in England. Not reading it or at least not accepting this book as a factual document is like not allowing Muhammad to be drawn in paper. But the in-your-face language used makes it really tough to take it on the chin!"